Response to Intervention integrates assessment and intervention to maximize student achievement and to reduce behavioral problems. With RTI, schools use data to identify students at risk for poor learning outcomes, monitor student progress, provide evidence-based interventions and adjust the intensity and nature of those interventions depending on a student’s responsiveness, and identify students with learning disabilities or other disabilities. settings in a school and nonclassroom settings. 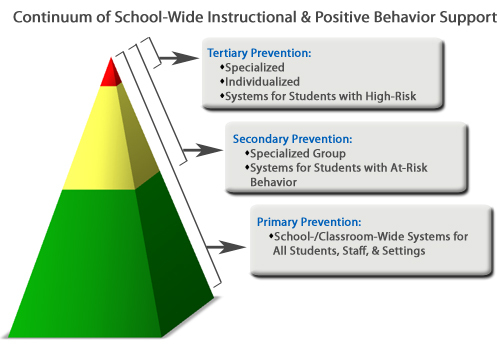 This approach uses proactive strategies for defining, teaching, and supporting appropriate student behaviors to create positive school environments. 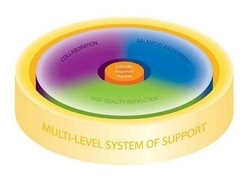 Instead of using a piecemeal approach of individual behavioral management plans, a continuum of positive behavior support for all students within a school is implemented.